Built in the Pimlico district of London. Designed by Powell and Moya. Considered to have great significance and was the subject of an article written by Modernist Critic Henry Russell Hitchcock. Two themes were discussed within the article, one being that housing could have the potential to have monumental quality. Hitchcock compared the first two blocks constructed to Mies’ Lake Shore Drive. The projects’s modernism principles were clear through the use of conctrete frames and the use of colour. Churchill Gardens is claimed to be one of the more successful large scale housing schemes within London. 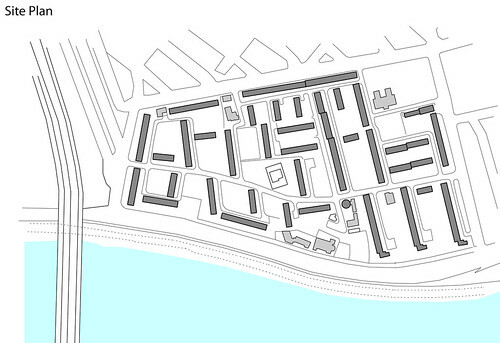 The projects combines familiar urban arrangements of streets and squares. The project had an innovative collective heating and hot water system by reusing the waste heat from the Battersea power station on the other side of the thames. 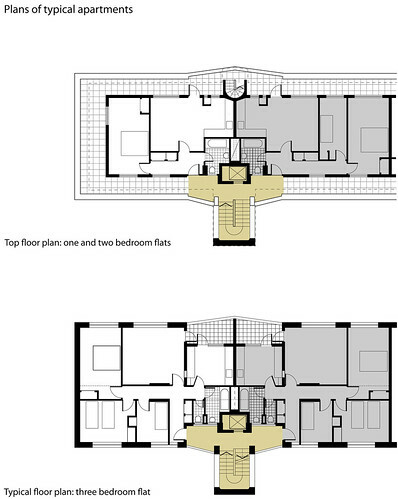 The central heating scheme created freedom in plan with no requirement for flues. Efficiency of plan and privacy were considered of great importance. The commitment to efficiency was demonstrated by Powell and Moya taking part in the BRE project to survey housewives’ work in order to improve their kitchen design. The Kitchens and bathrooms were grouped together for efficiency of servicing. 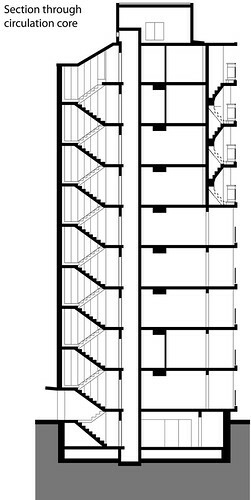 Each apartment has a private balcony to one side and an entrance to the other accessed via stairs or elevator. Each landing accesses only two apartments with a ‘porch’ area to each apartment unit.